Staged in the UNSW Library Exhibitions Space, In Response: Dialogues with RealTime is a unique exploration of the relationship between art and reviewing. It features Sydney-based artists who have been extensively covered in RealTime: Martin Del Amo, Branch Nebula (Lee Wilson, Mirabelle Wouters) and Vicki Van Hout. 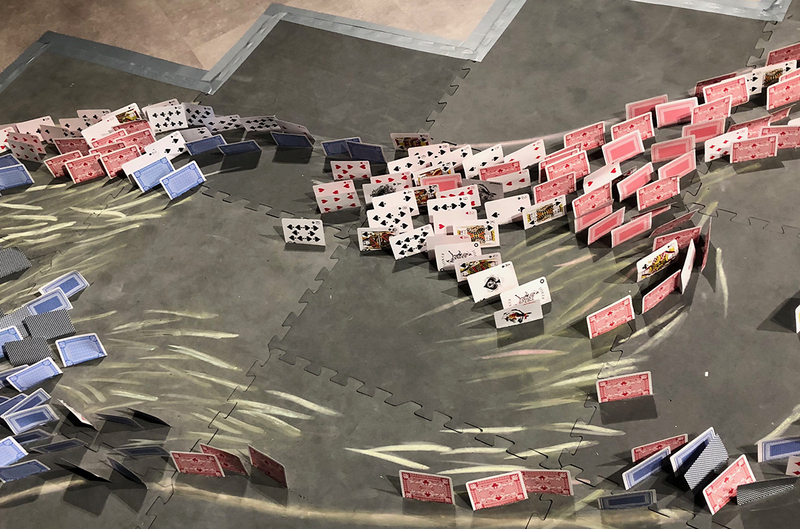 Van Hout has recreated her striking river of playing cards set from Briwyant and invited her audience to engage with it; Branch Nebula has provided visitors with pencils to write on the walls their recollections of the works alongside vivid production photographs; and Martin Del Amo has juxtaposed memorable images by Heidrun Löhr of his works with reflections on the performances, including fascinating responses to RealTime reviews. As well each of the artists has made a live presentation which has been recorded for future open access. There are audio recordings of the artists being interviewed and RealTime writers reading reviews selected by the artists, alongside other archival material. Cases display copies of RealTime open to the pages where works by the artists were reviewed, while others house artefacts from some of the productions. The mix of installation, performance and online material makes for an exhibition with depth and, given the online record, durability. For a more detailed account of the exhibition and the artists’ presentations, go here. 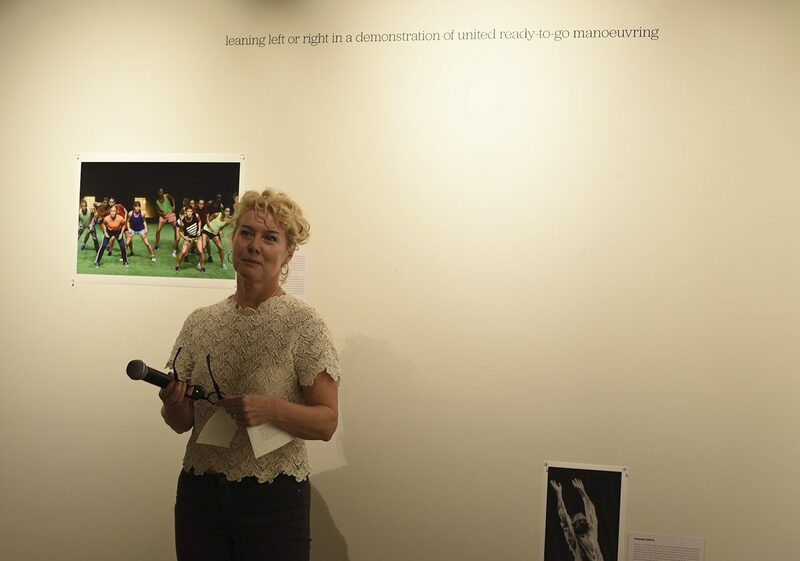 We at RealTime are deeply grateful to Erin Brannigan and UNSW Library and staff for an exhibition which complements and enhances the impact of RealTime archive. Here, from the UNSW Library website, is the background to the mounting of this exhibition and the crediting of the large number of contributors to its success. 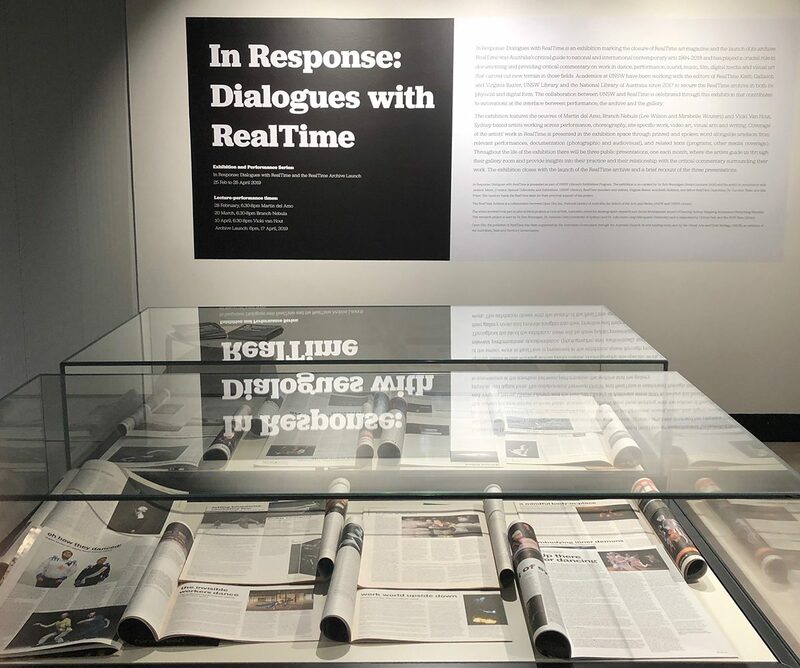 “In Response: Dialogues with RealTime is an exhibition marking the closure of RealTime art magazine and the launch of its archive. RealTime was Australia’s critical guide to national and international contemporary arts 1994-2018 and has played a crucial role in documenting and providing critical commentary on innovative work in dance, performance, sound, music, film, digital media and visual art that carved out new terrain in those fields. “Academics at UNSW have been working with the editors of RealTime Keith Gallasch and Virginia Baxter, UNSW Library and the National Library of Australia since 2017 to secure the RealTime archive in both its physical and digital form. 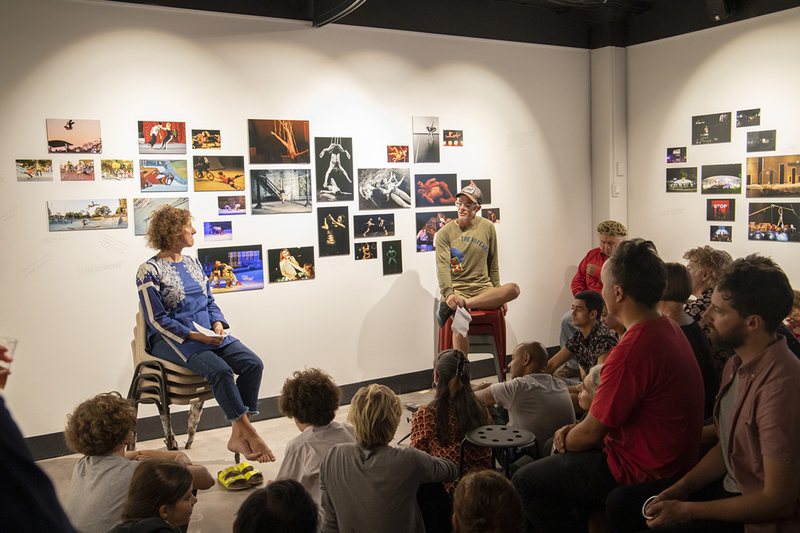 The collaboration between UNSW and RealTime is celebrated through this exhibition that contributes to innovations at the interface between performance, the archive and the gallery. “The exhibition is presented as part of UNSW Library’s Exhibitions Program. It is co-curated by Dr Erin Brannigan (Senior Lecturer, School of the Arts & Media) and the artists in consultation with Jackson Mann (Curator, Special Collections and Exhibitions, UNSW Library), RealTime founders and editors, Virginia Baxter and Keith Gallasch, and fellow RealTime Guardians, Dr Erin Brannigan, Dr Caroline Wake, Gail Priest and Katerina Sakkas. “The RealTime Archive is a collaboration between Open City Inc, National Library of Australia, the School of the Arts and Media, UNSW and UNSW Library.